The flood waters that struck the Ninth Ward after Hurricane Katrina washed many houses, like this one, from their foundations. Only the front porch remains. "God bless you and all the help you're providing." The man who made that remark as he passed our worksite in St. Bernard Parish was middle-aged and spoke with the drawl that had grown familiar to us since our arrival in New Orleans a few days before. Another resident of the area — a part of the city hit hard by Hurricane Katrina three years ago — gave us two large sacks of glittering green, gold and purple Mardi Gras beads. The present was a welcome token since our team, under the supervision of Habitat for Humanity, had spent a sweaty day installing a roof for the Baker family's home, one of those badly damaged by the 2005 storm that flooded the city, killing more than 1,800 people across the north-central Gulf Coast and reducing entire neighborhoods to rotten wood and rubble. Our reconstruction effort formed part of a weeklong Kellogg Leadership Expedition (KLE) in March that brought a dozen Kellogg students, along with some friends and spouses, to New Orleans for an atypical spring break. We weren't hitting the Bourbon Street bars down in the French Quarter; instead, we were hitting nails, hauling ladders and removing debris to do our part and help rebuild a community still recovering from a natural disaster whose estimated damage costs topped $90 billion. Organized by the Kellogg School's Business Leadership Club (BLC), our excursion was one of three experiential learning initiatives this spring designed to enhance students' leadership abilities by putting our hands, hearts and minds to work. The goal was to make a difference for others while gaining valuable insights about ourselves as we refined our decision-making skills. Living in New Orleans for the past 10 years, Plyer has grown passionate about her adopted city. This was evident despite the grim statistics she presented to us: Repopulation has diminished and only 19 percent of public buses are operating. Of the top five jobs facing labor shortages, three require recovery-related skills, like architecture and engineering. But not everything is dismal. Private school enrollment has reached 83 percent of pre-Katrina levels and the number of Louisiana families living in FEMA trailers decreased by 19 percent between last September and December. Cargo and bulk cargo activity in the port reached 90 and 95 percent of 2004 levels, respectively.3 "What keeps me sane is that I do this work," Plyer said. Members of the Kellogg Leadership Expedition to New Orleans take a break on the steps of the house they built with Habitat for Humanity. The site leader, Danny Stephen, is at right in yellow. In addition to this excursion, two teams of Kellogg students traveled to Patagonia in Chile and the San Rafael Swell area of Utah. Our meeting with Plyer was invaluable preparation for our next appointment, with Angelo DeNisi, dean of the A. B. Freeman School of Business at Tulane University. He shared an emotionally charged account of how the storm affected his school and challenged his leadership. DeNisi had just begun his tenure before Katrina hit; after the storm, the school's administration was faced with conditions unimaginable even for seasoned executives. Students arrived on campus at the end of August but, as a precaution, were sent home immediately. "Everybody evacuated with the thought that they would be gone for three days," DeNisi said. "Hurricanes come here. Everybody knows what happens: You take three days of clothes with you or else stay here." While the storm did pass relatively quickly, DeNisi and other evacuees watched from out of town as news reports revealed that over half of New Orleans was under water. It soon became clear that the city was uninhabitable — a stunning fact that presented a host of serious implications, one of which meant that Tulane was closed and classes were cancelled. The administration moved to Houston and looked to Tulane president Scott Cowen for guidance. "When I think of the role that leadership played in this, I think of Scott Cowen," DeNisi said. "He came into that first meeting we had and said, 'This university will reopen on Jan. 16. There's no question, no debate, and what we do now is figure out how we open on Jan. 16.'" DeNisi said it was only later that Cowen revealed that he had doubted whether Tulane would rebound, yet the chief executive never wavered in his public optimism, and this confidence strengthened his team. "Without that, I don't know if we would have ever reopened," DeNisi admitted. To meet that goal, though, Cowen had to make tough decisions, including eliminating 10 percent of the faculty, along with five undergraduate programs and eight sports programs. Expedition participant Brian Thome '08 heard this lesson loud and clear: "I learned that I need to be more decisive in a leadership position. While it is good to solicit feedback and seek consensus, sometimes the leader just has to make a decision and be willing to live with the consequences." After leaving Tulane, our team spent the afternoon aboard a coach bus with guide Carol Stauder. This was not the lighthearted city tour of most vacations. Stauder's route took us along the course that Katrina followed and provided a glimpse into the devastation that still remains. "I call this the good-news/bad-news tour," the longtime Louisiana resident said. "The good news is you take a look at the French Quarter and you wouldn't know that Katrina hit. The bad news is that the rest of the city, the part where everybody lives, is still struggling to come back." For three hours we drove past boarded up, abandoned houses. Nearly all were defaced by the high-water marks that reminded everyone of how serious the flooding was. While driving through the Ninth Ward, we came to a neighborhood that was full of new houses painted in brilliant colors. "Musician's Village," Stauder said, a neighborhood of 80 homes backed financially by artists Harry Connick Jr. and Branford Marsalis. The bulk of the Habitat for Humanity work was underway here. Houses stood in various stages, some with families who had settled in, others needing landscaping, and still more arising as mere wood skeletons. At least there were children playing in the street and residents standing on their finished stoops. We returned the next day to Musician's Village, where Zac Margolies, construction manager for the Greater New Orleans Habitat chapter, told us that most of the work was in the Upper Ninth Ward and in Jefferson, St. Bernard and Plaquemines parishes — areas within a few miles of the French Quarter. Approximately 150 homes were under construction. From the top of a cargo container, Margolies explained the program: "What we do is provide decent affordable housing to people in need. They pay for only the cost of the materials and land through an interest-free loan." In lieu of a down payment, residents put in 350 hours of sweat equity, working on their neighbors' houses and their own. "They build the community that way," Margolies said. 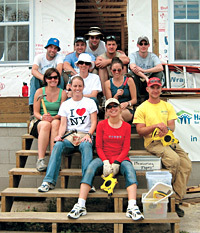 The housing is affordable because volunteers provide free labor. "We could not build these houses without volunteers like you," he told us. Margolies then assigned us to our site manager, Danny Stephen. We followed Stephen to the Baker's home in St. Bernard Parish, east of City Park. 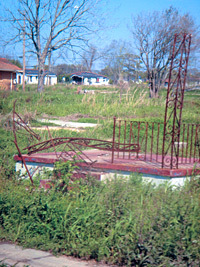 Katrina had decimated the area, with the storm's eye passing over part of the parish and leaving up to 12 feet of standing water. The Bakers lived opposite a large, partially demolished housing project that we had passed during the previous day's tour. Joy Baker said they chose to stay and help restore their neighborhood, dedication that found them living for more than two years in a trailer adjacent to their new home. Each morning, Stephen would explain the day's projects. We would divide into teams and set to work. Throughout the week, we raised roof trusses, sheathed the roof, installed windows, wrapped the house in waterproofing material and painted trim. Even less glamorous jobs, like holding someone's ladder, were as necessary as using a power saw to cut wood or hammer nails on the roof. Through these tasks we learned about each other and how to pull together as a team for a common goal. Dan McDonough '09 said he learned the importance of patience when leading a team. "I think Danny's leadership allowed everyone to accomplish as much as possible given our experience levels," he said. McDonough himself was a natural leader on the site, having done some prior construction work and taken another Kellogg service trip to New Orleans in 2007. He said the most challenging aspect of our team's visit was learning and implementing new skills quickly. Each of us wanted to do as much as we could for the Bakers in the four days we had there. The excursion "provided an opportunity to develop relationships quickly and accomplish a lot with people of all experience levels," McDonough added. "I enjoyed having the chance to help." Like other Kellogg Leadership Expeditions, ours provided a context to develop as socially responsible leaders. Each trip offered time for discussion and reflection. "The goal is to help you develop your personal leadership style, build self-awareness and emotional intelligence, make decisions in the face of uncertainty and internalize concepts taught in the classroom," said Meredith Mason '08, vice president of Leadership Expeditions for the BLC. Leadership is a major focus at the Kellogg School, where Associate Professor of Management and Organizations Michelle Buck is director of leadership initiatives. In this role, she challenges students to get out of their comfort zones. "It is common to think of leadership as leading other people, but a strong foundation of leadership is self-reflection," Buck points out. "If you don't know yourself, your strengths and your weaknesses, how can you be an effective leader?" Buck attended last year's expedition to Patagonia and said these trips are an extraordinary occasion for participants to place themselves in extreme situations and to explore each others' leadership styles. By March 30, our team had returned to Chicago with memories of the Southern food and hospitality we enjoyed in New Orleans, but carrying the sobering images of Katrina's devastation. We compared notes with the Kellogg groups that traveled to Chile and Utah, trading stories about how leadership came alive during each trip. We met with Senior Associate Dean David Besanko, with whom we exchanged leadership lessons. He believes leadership entails persuading others to pursue a common, mutually beneficial goal. Our team's goal was completing as much of the Baker's house as we could, and we saw this objective best accomplished when we deferred to each other's strengths. "It's hard to imagine a leader emerging who didn't have some specialized knowledge," Besanko told us. At Kellogg, KLE participants have been making an investment in themselves by pursuing an MBA program that offers both breadth and depth of knowledge. "It cannot be denied that intellectual depth is a resource that leaders bring to the table," Besanko said. Because of our New Orleans experiences, each member of our team brought back new perspectives, new friends and new leadership skills. I also brought back a few strands of those beads: Shiny purple, they represent for me the pride that New Orleans residents have for their city's history and rebirth. The baubles hang in my closet where they remind me of the modest difference I made on the city, but more importantly the impact it had on me. 2 The data is released quarterly and available at gnocdc.org.